I’ve mentioned before how much we love “breakfast for dinner” at our house. These easy scones are more like “breakfast for snack” or even dessert… Or lunch, or midnight snack, etc… Seriously I make them all the time, changing up the shape and whatever I put into them. 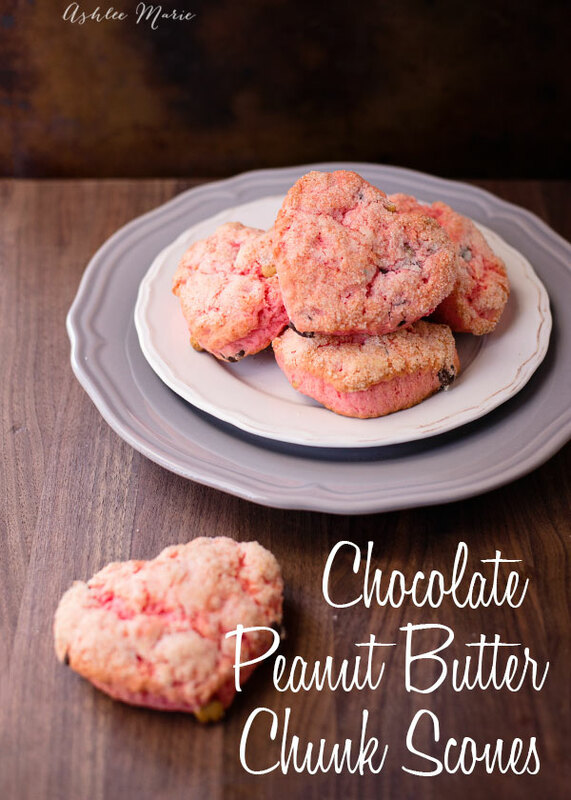 I make a TRIPLE batch of these and eat them for pretty much every meal until they are gone! 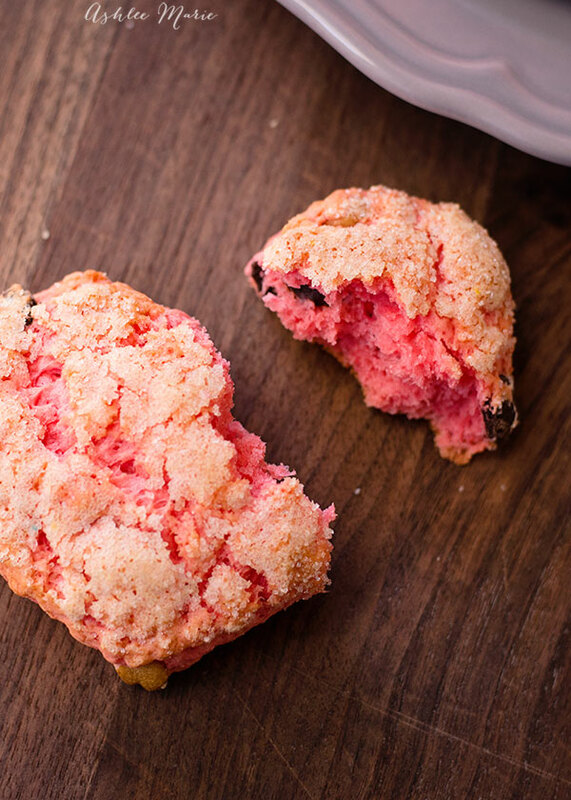 I’ve shared this chocolate chunk scone recipe before with just chocolate, BUT for valentines day I had to make something special for my sweetheart. His favorite flavor is peanut butter and chocolate so it just made sense to do half and half! 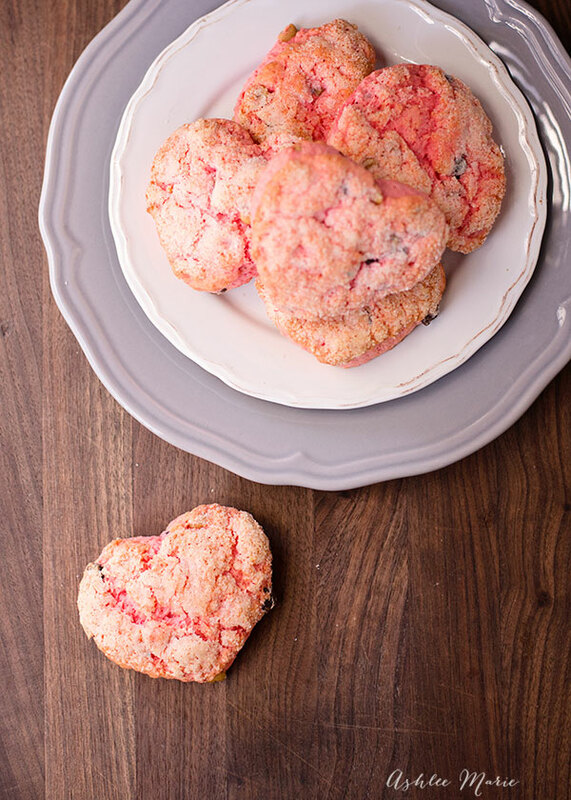 Add some red or pink dye, and a heart shaped cookie cutter and BAM the perfect treat for Valentines day! My kids loved coming home to these for their after school snack. AND my husband loved the special touch of using the peanut butter chips. What would YOU add for your special someone? Any favorite flavors you love in baked goods? Or that you add for special for your family? 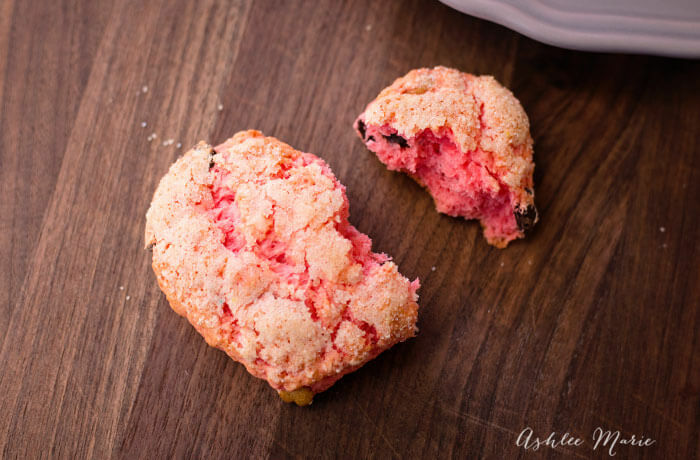 If I was making these for myself I’d make my Lemon scones. Maybe I’ll try a coconut version… Ohhh YES that sounds SO good right now! Whisk flour, sugar, powder, salt, powder food dye and the chips. Transfer the ball to a slightly floured surface and roll out about 3/4 inches tall. Then I used my small heart cookie cutter to cut out hearts. Brush top with extra cream... and dip the wet top into a plate of red sugar- I like the large chunky sugar for these. And there you have it, SUPER easy, tasty with a great texture AND SOOOOO pretty! As I was reading this post, my boyfriend looked over my shoulder and exclaimed. WHAT ARE THOSE? THEY LOOK DELICIOUS. I will be making these soon. Thanks for the awesome recipe! Thanks so much! I make them ALL the time, and they are so easy to change for other holiday’s, with all the colored sugar and cookie cutters around you can really have a lot of fun! I will print your recipe! So cute! 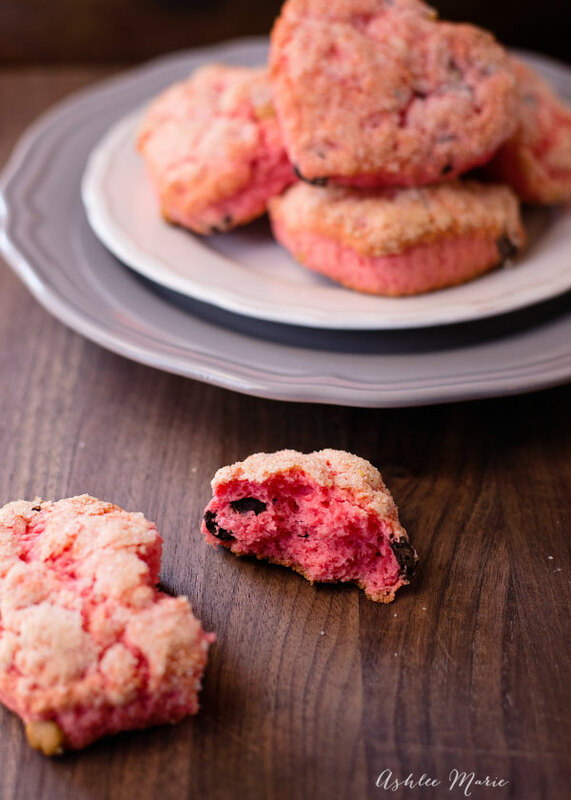 What an easy way to create delicious holiday cookies! And posting in two languages! VERY talented! so pretty and so yummy sounding! Thanks so much! I think so, my kid request these all the time and I love eating them so I do!! !